Since the 1600’s, hardwood floors have been used to bring a smooth, rich, and timeless appeal to living spaces. It’s beautiful aesthetic is impossible to replicate, even though more cost-effective options like laminate do their best to provide a similar charm. Unfortunately, however, wood flooring offers all-natural textures and unique visual characteristics that simply can’t be simulated by man-made products. 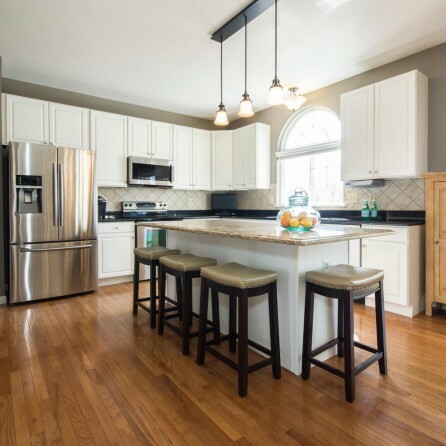 For this reason, when homeowners or entrepreneurs want to add an authentic, warm, and earthy sophistication to their chosen area, they often make hardwood flooring their selection. At Freedom Flooring, we make it our mission to source high-quality, long-lasting, and visually-stunning hardwood flooring options for the clients we serve. From deep, vivid mahogany to rustic, knotty hickory, we have a style to match your vision. There are a number of reasons why our clients choose to make hardwood their preferred flooring type. Aside from being available in a wide-range of finishes and styles, hardwood flooring is also the most value-adding flooring type. In fact, hardwoods can increase your home’s resale value by as much as 12 per cent. This is because potential home buyers recognize the cost and long-term durability of wood flooring. More specifically, 54 per cent of home buyers state they are willing to pay more for a house with hardwood floors. So, if you not only want to enhance the visual appeal of your living space, but also want to protect your real estate investment and secure the best possible return when the time comes to sell, hardwood flooring is likely the ideal choice for you. When hardwood floors are manufactured, installed, and finished professionally, they can last for hundreds of years. Protecting your wood flooring from wear and tear is actually quite simple, if you follow the proper best practices. Using a gentle, non-toxic cleaner that is intended for use on wood is always best, and using a dry or lightly-damp mop is recommended. And while most hardwood floors are finished with a protective layer of sealant, scratches and dents can still occur. To combat this, it is advised that homeowners use furniture pads to prevent scraping, or place area rugs in high-traffic areas to avoid scuffing and discoloration. When these guidelines are followed, solid wood flooring can last up to 100 years, and engineered hardwood floors can last between 20-80 years, depending on the thickness of the plank. When compared to other flooring types, including carpet, specifically, hardwood flooring is significantly better for your health. Unlike carpet, hardwood floors aren’t a haven for dust mites and allergens. In fact, contamination from dust, mold, or contamination is far less common in homes that have hardwood compared to other flooring types. Additionally, common odors from cigarette smoke, pets, and food do not become trapped in the pores of hardwood flooring the way they become trapped in carpet fibres. Remember, studies have shown that there are a significantly larger amount of dust deposits and a higher percentage of viable microorganisms in carpet than in hardwood floors. So, if keeping your space clean, fresh, and free of potential allergens is important to you, hardwood is an ideal first choice. HOW DO I KNOW WHICH HARDWOOD FLOORING OPTION IS RIGHT FOR ME? One of the first things we urge our clients to consider is the Janka scale. The purpose of the Janka scale is to inform homeowners how durable and long-lasting each wood type is. How much foot traffic will my flooring be exposed to? Will pets frequently be kept in the space where my flooring is being installed? How many people will be in my home or business space? Could the space where my floors are being installed become extremely humid? All of these factors can impact your wood flooring, so being proactive in considering these risks is essential. For family homes where children and pets are active throughout the day, a flooring option that ranks high on the Janka scale would be best. On the other hand, a sitting room in a retired couple’s home would be subject to less foot traffic, and therefore wouldn’t require such a high-ranking flooring type. It all comes down to how your space will be used, and the environmental factors it could be vulnerable to. Looking for advice on the best hardwood flooring option for your home or business? Our Edmonton flooring contractors are always available to discuss your options with you. DOES FREEDOM FLOORING OFFER HARDWOOD INSTALLATION? Absolutely. Our team of experts offer flooring installation in Edmonton at competitive rates. And with over 50 years of combined work experience, our carpet installers have the training and knowledge required to deliver a superior level of quality, completing your job on time and within budget, so you can enjoy a worry-free experience from start to finish. ARE YOU READY TO BOOK YOUR HARDWOOD FLORING INSTALLATION?